The Derry River rises north of Tinahely and flows through Shillelagh before entering the Slaney at Killdavin. 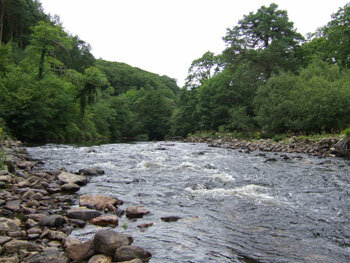 It is primarily regarded as a spawning river for the Slaney. The Derry River holds small brown trout averaging 6 ounces. The river is very overgrown and is rarely fished except by a few local anglers. The Derreen River rises north of Hacketstown in Co.Carlow and flows southwest to meet the Slaney below Tullow. The river holds occasional salmon in the spring. Upstream is better known as a trout river, the average size of the trout is around 0.5lbs and it can produce a very occasional fish to 3lbs. The best of the fishing is from March to June. There the Aughrim River which is located at Woodenbridge, where Aughrim meets Avoca are a number of rivers in the locality renowned for fishing. 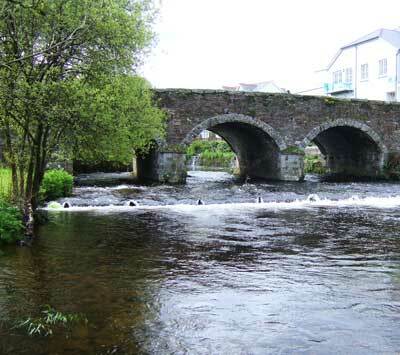 The rivers Aughrim, Ow and Derry hold numerous small brown trout. Trout fishing is also available for all at Aughrim’s “Angling for All” National Disabled Angling Facility, with its wheelchair accessible lake, located in the village beside the Park Pavillion. Aughrim has it’s own bowling green, also located beside the Park Pavillion. . Parking in the village of Aughrim outside Lawless’s Hotel.